Thank you for listening to this highly informative podcast that will help you debunk some common myths, shatter ridiculous misconceptions and help lay the necessary foundation for building a successful real estate business. If you are here looking for the magic pill for instant riches, I can save you the time of searching since you wont find it here. This podcast is for those who are ready and willing to work hard and simply need a proven road map to getting into real estate. This ground level guide will show you how to get into real estate if you don’t have a large budget for marketing. By replacing money with your time, you can become twice as effective and more likely to get results by doing the up front work required to generate consistent lead flow. I learned so much on my first deal. After 18 months of wondering if this business was right for me, I finally popped off my first payday….and then gave 60% of the deal away. What I realized is that I could keep struggling for 18 more months or just pay homage and have concrete proof that I can do what I just did, without having to have someone hold my hand and duplicate those results over and over. This podcast is completely for the mindset that always wonders and wanders.The term slow and steady wins the race is built on the same principle as staying persistent and consistent. Eat an apple a day for life and you know the results you get. Same goes with eating a chocolate bar. In real estate we call it SSDA. Same stuff, different address. It may be boring. However, stick-to-it-ness will conquer even the toughest of times. This little rant came to me at 2am when I was in the middle of a transition in our business. I had been searching for a way to help new and seasoned investors learn the biggest breakthroughs that shaped and formed our business to what it was then. The nuggets are rarely talked about in home study courses or on tonights webinar. This little rant should sell for the price of most ebooks. Yours to keep. 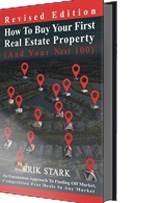 How to Buy Your First Real Estate Property is a ground level look at how to buy properties at a street level. We have made more income, generated more wealth, raised more capital, done better quality deals and created one of the nations greatest seller experiences by understanding investing at a ground level. This book is just the beginning, but it offers pure gold to the investor who is looking for a tried and true, low cost entry into real estate. The daily action steps offer reassurance that every investor eventually faces….am I doing what I am supposed to be doing every day to get the results I need from my business. A must have for every new investor. When the nations top investors such as Than Merrill, Kent Clothier, Ron Legrand, Mark Evans, Larry Goins and myself included were asked what they would do if they had to start over….the result was an inch thick book filled with simple to implement strategies that anyone can apply to their business. This is a power reference manual is a must have for serious new investors. 7.50: Learn how to fish in ponds that no one is fishing in. 10.35: Learn what strategy you want to be using to narrow your niche down. 15.15: Have a general idea of why you are doing the new venture in real estate. 51.06: Direct Mail – Don’t choose decide on several campaigns that you will follow through. Next PostNext Learn To Build Wealth: How To Structure Your Next Wholesale Deal.